Gas Pipe Reviews: 10 Top-Rated Report - The Best in April 2019! When you want to connect a grill, or perhaps a laboratory device, you automatically require a reliable natural gas pipe. These pipes come in many forms, ranging from an underground gas pipe to a flexible gas pipe. There are many different types, and each one is designed for specific purposes. Distance, Pressure and Gas type. Obviously the further the distance the more pressure you need in the system, and this requires a stronger pipe. Different gas types react to different materials, so you need to stick with industrial standards. Finally, the actual source can be a small tank connected to a grill, or the main gas supply connecting to a large industrial burner. The range of piping is as varied as the different types of gas there are. In this review, I present to you a list of the top ten flexible pipes that can be used with most standard fuel gasses, including natural gas, and propane. These pipes are all chosen based on their production conformance to standards, and the materials used for safety and reliability. The GasFlex pipe is a durable aluminum tube covered in PE both internally and externally, which adds to the durability and reliability of this product. 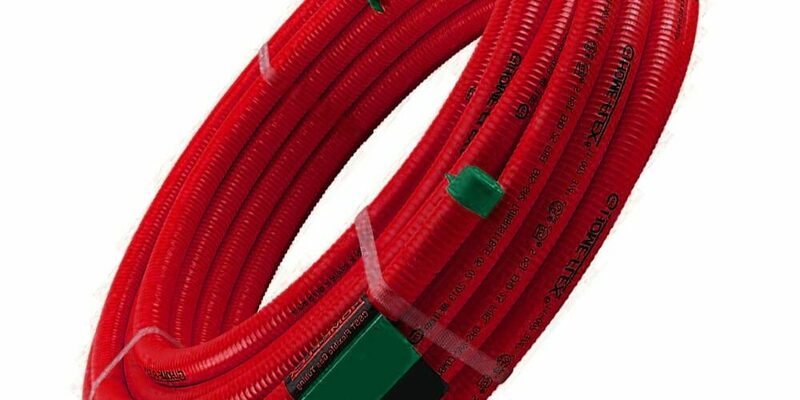 This piping system can be bent by hand or with a tool and can be used indoors and outdoors. 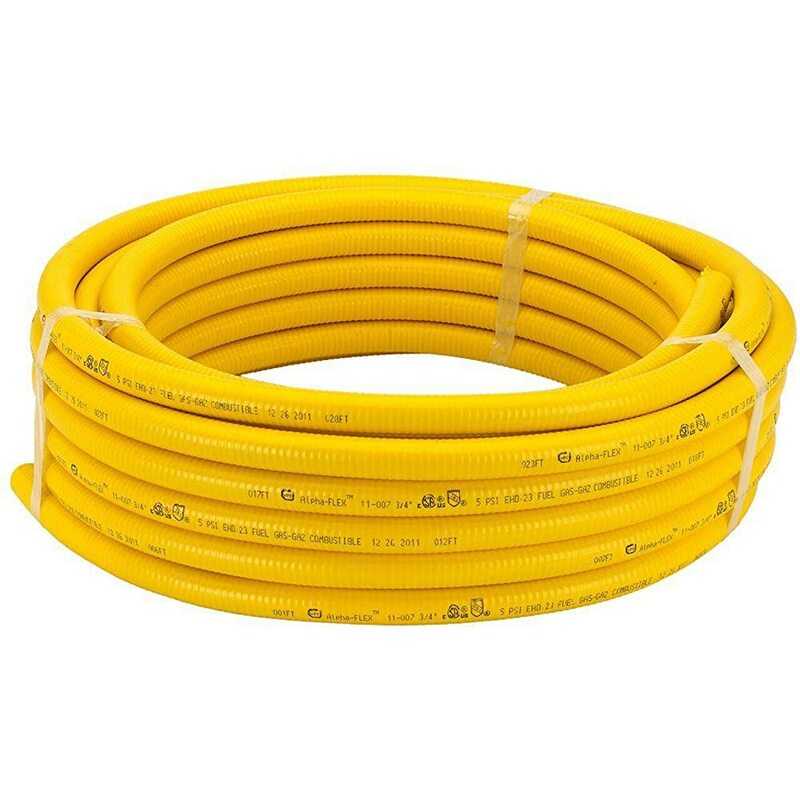 This is a professional grade hose for construction purposes. This is an aluminum pipe, which is not used much due to the softness of the material. However, this material is considered safe for small applications in residential environments. Markings: ½” Nominal Size = Marked 12-16, 12mm Inner Dia., & 16mm Outer Dia. The HOME-FLEX fuel gas piping system is a comprehensive, focused system that uses corrugated, flexible, semi-rigid stainless-steel tubing and an assortment of brass attachment fittings that are all designed for NPT integration into a black iron pipe or direct connection to gas systems. 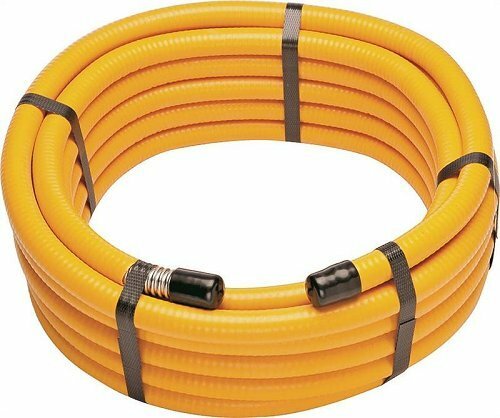 HOME-FLEX ¾” tubing is jacketed with a yellow polyethylene cover that shows the gas pressure rating, and EHD (Equivalent Hydraulic Diameter). 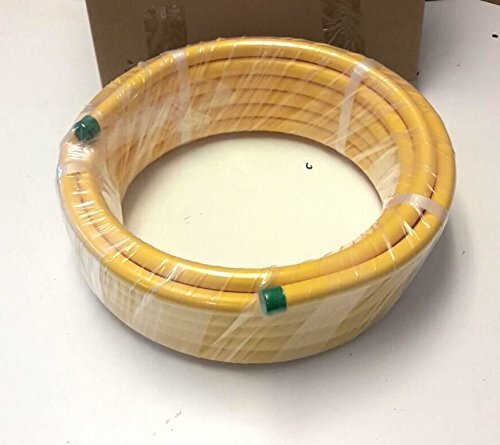 This SKU is a 75-foot coil, and you can purchase tee fittings for branch lines in tubing runs, reducer tees for differently sized tubing run, and special termination flanges for standard gas appliance connections. 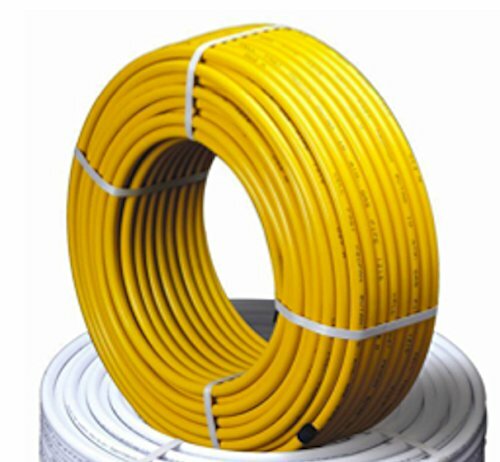 HOME-FLEX yellow CSST is an IPS yellow poly gas pipe that is engineered to deliver natural gas and propane. 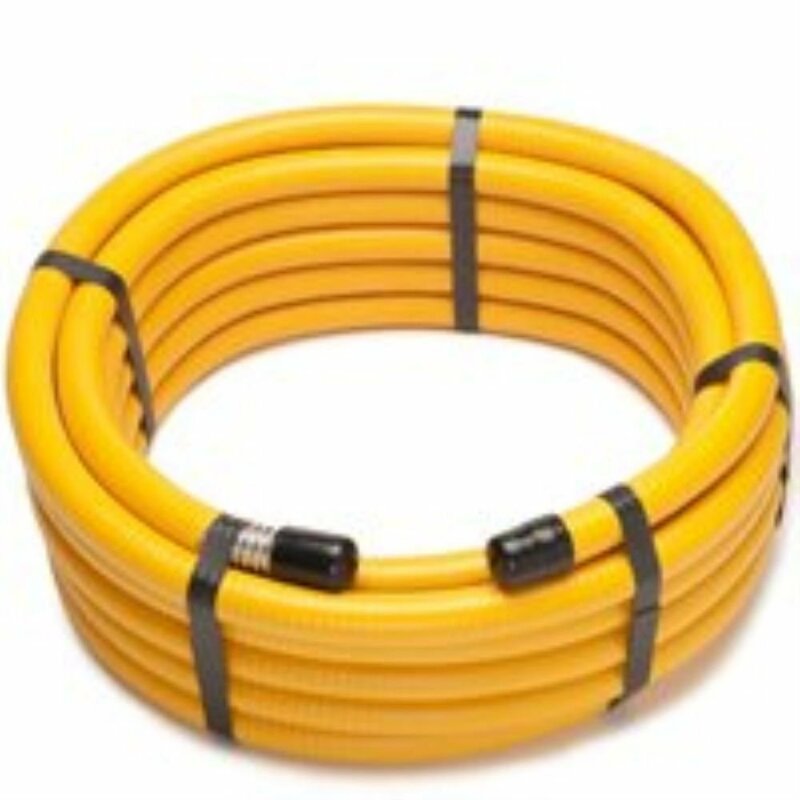 This model is the HOME-FLEX ¾” tubing is jacketed with a yellow polyethylene cover that shows the gas pressure rating, and EHD (Equivalent Hydraulic Diameter). It is designed specifically for underground use and integrates with all the standard connections and fittings. This is a professional grade product for use in construction and infrastructure applications. This is identical to the 33’ GasFlex pipe, but in a 66’ length, and has an improved torque of 65 ft lbs. This piping system can be bent by hand or with a tool and can be used indoors and outdoors. This is a Corrugated Stainless-Steel Tubing (CSST) system that meets the following standards: ANSI LC-1a-2009, CSA 6.26a-2009, ANSI LC-1-2005 and CSA 6.26-2005. This system is extremely rugged and is best used for outdoor applications that require a strong, corrosion resistant material. It is a perfect solution for outdoor grills and such, as well as short runs for fixed applications. 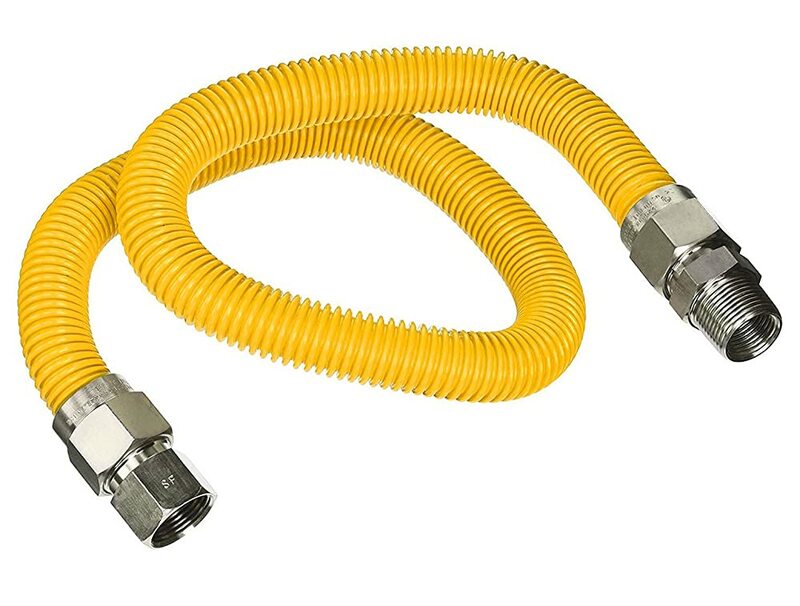 This is a simple gas hose made of PVC and comes with a 3/8″ female pipe thread, and a 3/8” male flare quick connector. This product is intended for use outdoors and underground; it is not for indoor use. The Flextron FTGC-YC34-36P is a thick and flexible 304 stainless steel gas piping that comes with an epoxy coating. The outer diameter is 1”, which gives you a ¼” of steel and epoxy coating thickens to protect the integrity of the piping. 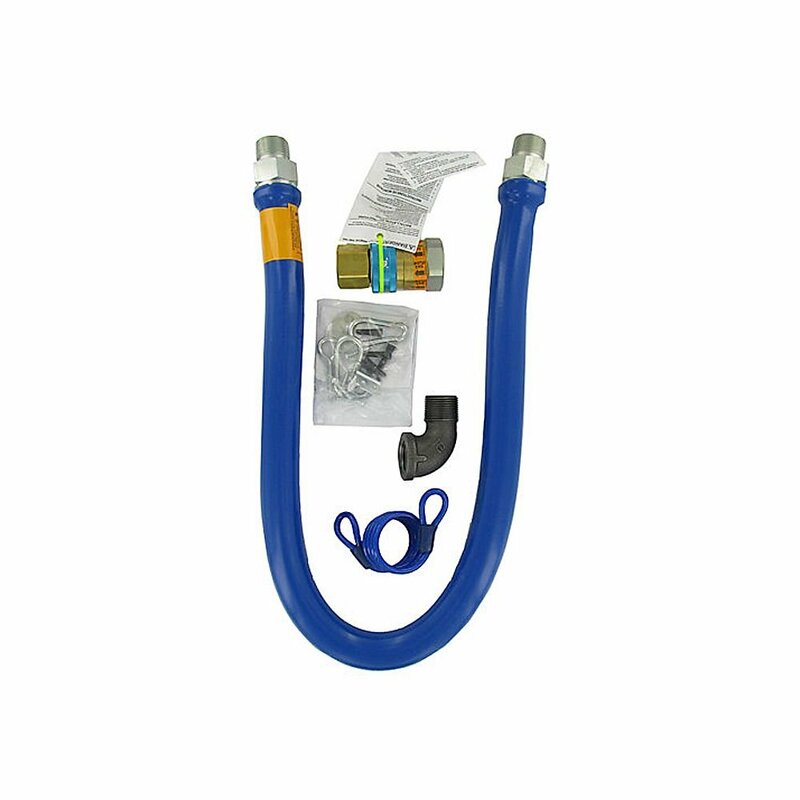 This model comes with two connectors, a stainless-steel male and female connector for maximum resistance to corrosion and pressure. This is an outdoor grill application and can be used with any system that requires a very basic connection. Dimensions: 36” x ¾” Dia. 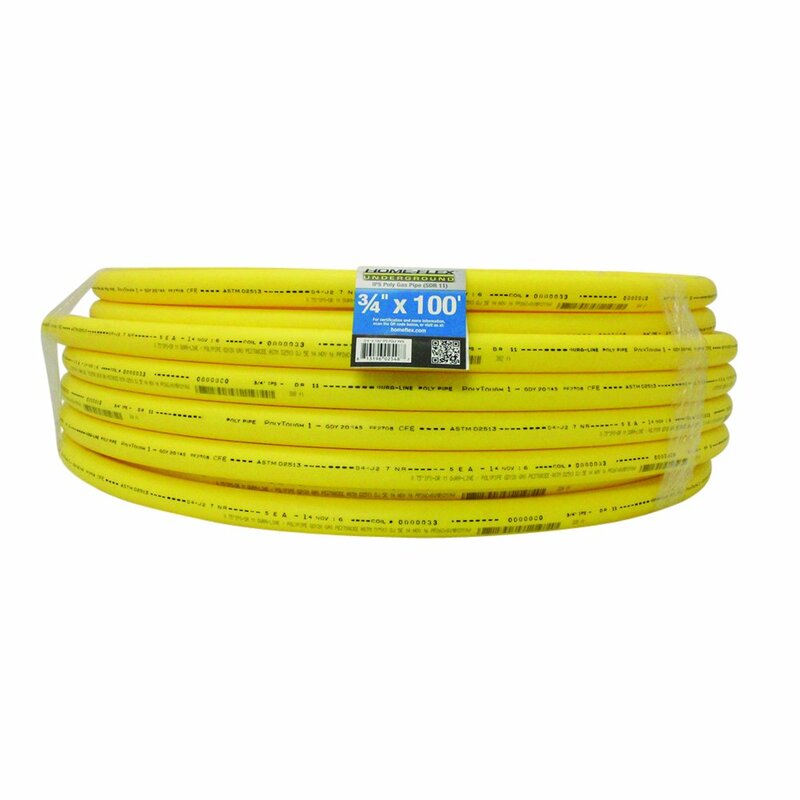 The Shinestar gas piping is a 12’ hose made of epoxy coated reinforced steel piping. 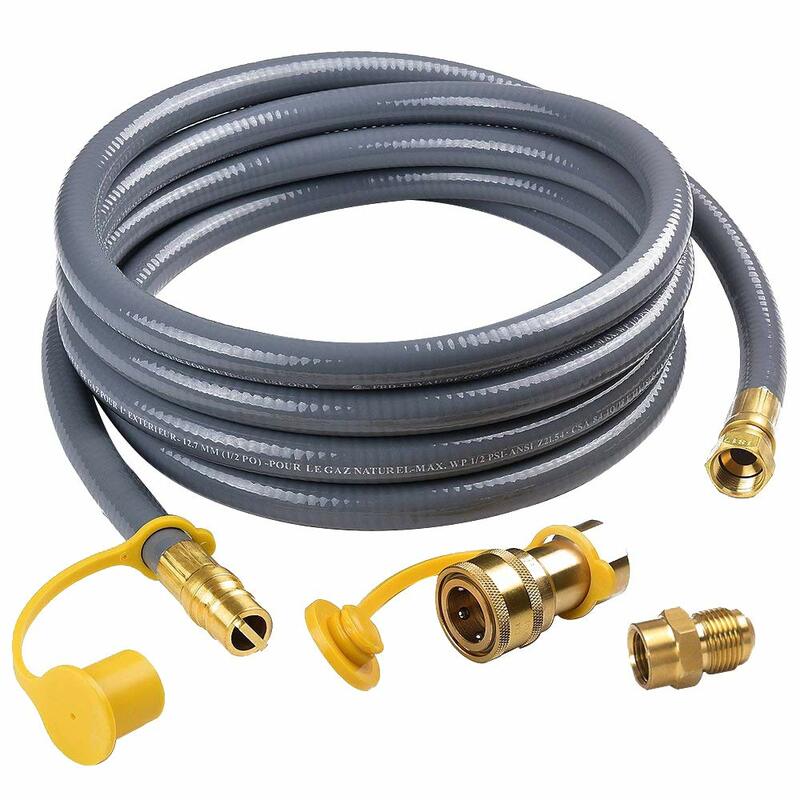 This part comes with a 1/2″ ID Hose, and a 1/2″ Quick Disconnect Plug with a 1/2″ Female Flare Fittings and a 3/8” Female Flare. There is also a ½” Male Flare Brass Adapter and comes with a dust cap and plug for extra fitting protection when not in use. This is a perfect product for outdoor home use, such as for grills and such. The dust caps are excellent for assuring this hose remains clean when it is disconnected. 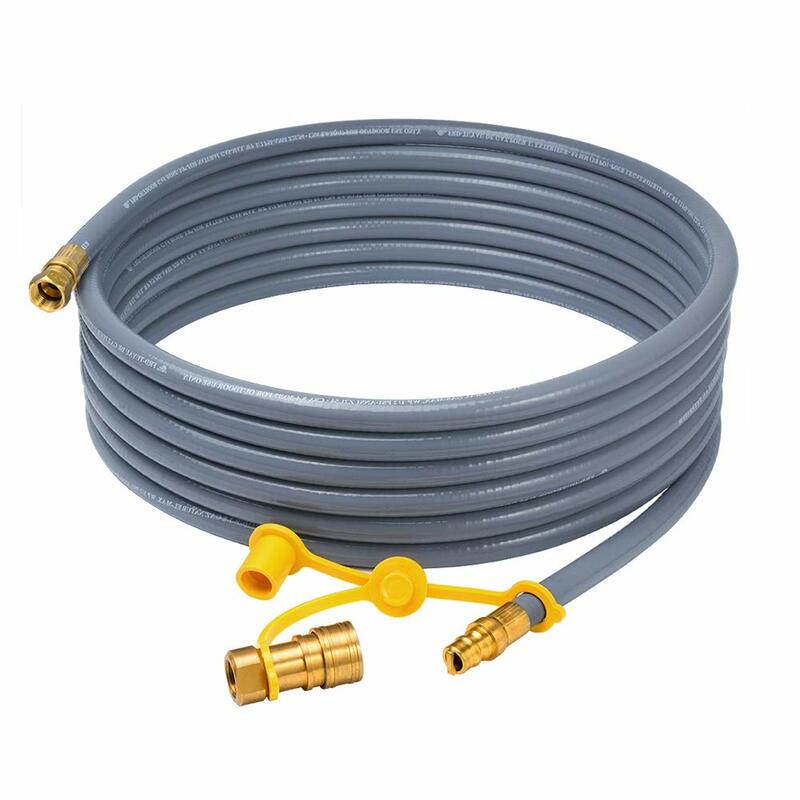 The Dormont Blue Hose® 1675BPQB48 is a moveable grade gas connector made of a 301 stainless steel corrugated tube covered with a tight weave stainless steel braid. This model has a ¾” inner diameter and is 48” long. What makes the Blue Hose® so special is their construction and detail. These products come with an antimicrobial PVC coating to prevent the growth of bacteria, mold, and mildew on the connector. The set comes with a rotational technology fitting on both ends of the connector; this allows the connector to rotate 360 degrees, which obviously improves performance and reduces wear and tear at the joints. The Blue Hose® models come with a unique push to connect quick disconnect system, that is designed for the foodservice industry. This feature integrates a thermal shutoff valve for extra safety. This is a professional model for restaurants, catering services, and for other high capacity indoor/outdoor gas applications. Pro-Flex is another inexpensive solution for outdoor grill requirements. This is a standard Flexible 304 Stainless Steel piping with epoxy coating and is manufactured to meet ANSI LC-1a-2009, CSA 6.26a-2009, ANSI LC-1-2005, and CSA 6.26-2005 standards. This product uses a Corrugated Stainless-Steel Tubing(CSST) design and comes with clear markings. This is a professional piping solution for use in construction and infrastructure. There are a number of options and also a harder coating for more complex applications. What pipes are used for gas? There are a number of options to use for gas pipes. However the most popular is the Corrugated Stainless-Steel Tubing(CSST) which use a stainless-steel tubing with a synthetic coating, inside and outside the tubing. In some instances, thick PVC and polyethylene (PE) pipes are used for buried outside pipes. In many cases, you will find older constructions that used iron (black iron), as well as copper, brass, and aluminum. However, those are rigid pipes, while the CSST versions are flexible. When choosing a pipe, make sure you understand the application, this includes the distance from the gas source to the appliance, the amount of gas needed to supply (PSI), and the number of appliances that might be needed to attach to the main supply source. In most instances, you will find rigid piping for indoor construction, such as copper and CSST, and flexible piping for outdoor applications as well as some modern housing constructions. Underground applications use PE and PVC tubing, while short applications will use CSST. What material is commonly used for gas piping in the house? As I mentioned above, there are a number of materials that are used in gas pipe systems. These all depend on the type of application, whether the requirement is for a fixed system, a large system, as well as for mobile systems. Other indications to decide what material is best used are environments, which include industrial, residential and Medical. Essentially, today, most gas piping systems are designed according to the amount of gas required for delivery. The larger the amount required, and the distance required to supply this gas will lead them to the use of wider, stronger metals. Rather than go into too much detail, here is a chart showing the pipe size required for different applications based on the required pressure. Steel pipes are used above ground when there are no corrosion issues, and due to the environment and Steel pipes and copper pipes are still the most common gas piping materials used inside buildings. These pipes need to be either L or K and approved for gas. Yellow brass pipes are used for inside installations. Aluminum pipes are not allowed for use underground, and in most cases are not approved for use. Not usually used anymore, but can still be found in some countries. PVC – Polyvinyl Chloride – are usually used outside, and underground. PE – Polyethylene – like PVC are used outside and underground. Can you use galvanized pipe for gas lines? No, galvanized steel is Zinc plated steel, and there are issues with the “galvanic” reaction between the zinc and steel. As such, regular galvanized iron is never used for natural gas lines. The pipe is simply an iron or steel pipe that has been coated with zinc for protection from corrosion, and yes, there will be a dissimilar metal or galvanic reaction between black iron and the galvanized coating. Is flexible gas line safe? Yes, if it is made according to standard. Today, most flexible pipes are made of a Corrugated Stainless Steel Tubing (CSST) which is both flexible and strong. Most grill gas lines you see today, both outdoor and indoor are CSST. These types of tubes are used in many locations and are starting to take over from the conventional rigid pipe system. Laboratories especially prefer CSST to copper and iron.